There is a story behind every person listed on Camden Remembers. Some of their stories will be told here. Select the links below to read each story. William (Bruno) Geary by Christine Robinson. The following story of four brothers, all born in Camden, was revealed while researching soldiers from the local area who served in World War 1 to be included on the Camden Remembers website. William, known as Bruno Geary was born 1881 in Camden, the 10th and youngest child of David Geary a blacksmith living at Harrington Park Narellan in 1872, and his second wife Bridget Woods. Bridget died while Bruno was still a baby and he was fostered by Austin and June Bugden, a Camden couple who had twelve children of their own and whose youngest daughter Hannah Maria was the same age as Bruno. Bruno remained with the Bugdens and later served his apprenticeship as a painter with H Goddard of Concord. Hannah Maria Bugden married William Henry (Harry) Boon in 1903 and Bruno went to live with them at Burwood. Bruno enlisted in the AIF on the 30th December 1915 at Town Hall Sydney and served with the 18th Battalion. He gave his next of kin as Harry Boon of Norwood St. Burwood. He departed Sydney on the troop ship 'Nestor' on 9th April 1916 and arrived in France via England on 23rd September 1916. Conditions in the trenches were horrendous and Bruno contracted Trench Feet and Bronchitis and was sent to England for treatment in November 1916. While in England he was operated on for appendicitis and after recuperating was back at the front in January 1918. It would seem Bruno never fully recovered and was invalided home to Sydney on the 'Medic' arriving 9th October 1918. William (Bruno) Geary died on 25th October 1918 at Randwick Military Hospital from Uraemia, Chronic Bronchitis and Nephritis contracted while on overseas service in France. He is buried in the Roman Catholic section at Rookwood Cemetery. After the war it was the policy of the Army to contact the named next of kin of the unmarried deceased soldiers requesting the name of the oldest living relative e.g. father then mother, oldest brother etc. so as to dispose of personal effects, medals etc. As nominated next of kin Harry Boon was contacted and he wrote a poignant reply. 'I know of no one who has more claim to anything belonging to the late Private W. Geary 18th Battalion No. 4430 than myself Harry Boon. William Geary and myself were like brothers. He made a will in my favour and left anything and everything to me. I sent it to the Military authorities at Victoria Barracks Sydney at the time. I got the deferred pay of the late Wm. Geary and they have not returned it to me since. I did not put the will through probate because I saw by some of the Military papers I need not as the amount left was under 100 pounds to wit 47 pounds five shillings. Geary lived with my wife ever since he was a little baby on the breast. They are the same age both born in 1881. My wife's mother adopted him when he was a few months old. His own father and mother are both dead years ago.' (David Geary died 1889 at Murrumburrah). 'The late Private W. Geary went to see a Geary who he heard was his brother and he said he believed he was, but Geary shut the door in Private W. Geary's face and told him he did not want to see the likes of him about his place. That was years ago. When Private W. Geary returned home sick from the war and came to my place, he said it was good to be home once more, the wife's mother and Geary lived with me practically for 20 years. Hannah Boon was granted Bruno's medals and Memorial Scroll and Plaque having signed a statutory declaration to 'preserve with due care any War Medals and other items given into my custody'. Although not on any local memorials but all born in Camden, further research revealed that three of Bruno's brothers, James, Patrick and Edmund also served. It is to be hoped that the family (apart from Bruno) stayed close as both James and Edmund gave as their next of kin their sister Mrs. J. Maher. Mary Ann Geary daughter of David Geary and his first wife Mary Ann Heffernan married John Maher in 1878. Patrick had married Elizabeth Reinhardt in 1900 and gave her as his next of kin. James and Patrick both returned to Australia. Edmund Geary who also served in the Boer War was killed in action at Gallipoli between the 7th and 14th August 1915. His memorial is at Lone Pine on the Gallipoli Peninsular. When photographing some grave headstones of servicemen at St Mathews Church Cemetery at The Oaks in 2010 we came across a memorial erected to commemorate a soldier who died in World War One. The inscription on the memorial simply says OUR JACK KILLED IN ACTION IN PALESTINE 4TH JANUARY 1918. Now for the Camden Remembers researchers Our Jack poses the questions, who is Our Jack and who is his family? In the book 'The Little Slab Church, St Mathews Church of England The Oaks' published in 2004, Noel Collison the author says 'The identity of Our Jack is known only to those who knew and loved him'. An on line search of the Australian War Memorial's Roll of Honour lists three Australian servicemen who died on 4th January 1918. One of those happened to die in Palestine and his name just happened to be Jack. Now it would be easy to presume and say wow that was easy we found Our Jack, but proving that Lieutenant Jack Diamond Sumner Potts of the Australian Flying Corps who died when his aircraft crash landed over enemy lines on 4th January 1918 lived in The Oaks or even had an association with the area isn't that easy. 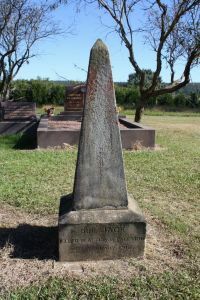 After several weeks researching Jack Potts and his family, making enquiries at The Oaks, Picton and Camden Historical Societies, searching local newspapers and the Sydney Morning Heralds of the day we now know a great deal about Jack Potts but we are still no closer to knowing Our Jack's real identity. We know Jack Potts was born in 1897 at Kingston New Maldon, Middlesex England and immigrated to New South Wales as a child with his family, father Arthur Ernest Potts, b.1859 d.1946 Molesey Surrey England and mother Lucretia Nanette Gilders, b.1858 d.1946 Molesey Surrey England. Jack Diamond Sumner Potts along with his brother Leonard Malcolm Potts enlisted in the 8th reinforcements of the 7th Light Horse Regiment. They were taken on strength by this unit on 28/12/15 and later transferred to the RFC and after training served with 67 Squadron AFC. Two sons of Mr. and Mrs. A. E. Potts, of Arcadia, Longueville, Lane Cove-Leonard M. S. Potts, previously of the Pitt-street branch of the National Bank of Australia; and Jack D. S. Potts, who followed pastoral 'Pursuits in Queensland-have been granted commissions in the Royal Flying Corps. Both Joined the Light Horse about two years ago as troopers. Jack's records show he was employed as a Jackaroo at the time of his enlistment, aged 18, on 11 May 1915. He initially enlisted as a Private (number 1203) in the 8th Reinforcements of the 7th Light Horse Regiment, with whom he embarked from Sydney aboard HMAT Suffolk (A23) on 28 July 1915. On 4 October 1916 he was promoted to Lance Corporal. He was detached to the Royal Flying Corps for air instruction on 10 January 1917 then to 67 Squadron, Australian Flying Corps (AFC) in May following the completion of his training. He was promoted to Lieutenant in October of that year, and graded as First Class Pilot. On January 4th 1918, Lieut. J.D.S Potts, Pilot and 2/Lieut. V.J. Parkinson, Observer, were flying an R.E.S, on a bomb raid on the enemy aerodrome at Jenin. They failed to return...On January 10th, a message was dropped by Hostile aircraft which stated that our machine had been forced to land and that Lieut. Potts had been buried and that 2/Lieut. V.J. Parkinson was slightly wounded and was the a Prisoner of War. It also stated that Lieut. 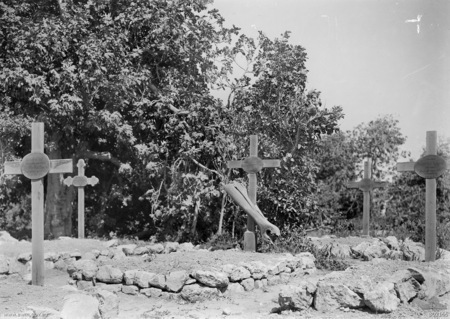 Potts had been buried at Jenin, and enclosed a photograph of his grave. Joe Bull, an aircraft mechanic also refers to the incident in regard to Jack Potts death in his diary which has been published called 'One Airman's War'. The entry for 26th June 1917 (added since publication) is interesting. "67(Australian) Squadron launched a morning bombing raid on Jerusalem which ended in very costly loss of machines. The target was the Turkish 4th Army HQ at the Mount of Olives, and involved eight aircraft. Many bombs were dropped at the target, but on the return flight events began to go wrong. The BE2e of Lt Brown was forced to land with engine trouble near Beersheba and, though two others landed to assist, it could not be restarted or destroyed owing sniper fire. Brown arose in Lt RA Austin's BE2e, but then this machine began to fail and landed once more. Lt AT Cole in his Martinsyde, probably No. 7487, attempted to pick up both men but his engine failed and he smashed his undercarriage in the forced landing. The three stranded pilots began to walk through no-man's-land to their lines, having buried guns, cameras etc., and were eventually rescued by light horse patrols. Their aircraft were never salvaged as Turkish forces later burnt them (the lost BE2es were probably Nos. 6803 and A2771). Meanwhile, two more BE2es ran out of fuel, having been delayed by events unfolding below, and had been forced down. Their pilots, Lt JH Butler in A1314 and Lt LMS Potts in A2777, were picked up by Capt AL Jones and Lt R Drummond in their Martinsydes and they returned safely. The two BE2es could only be salvaged for spares. In all, four BE2es and one Martinsyde were lost." "The Hun was over this morning with a scout flying high above escorting him. He dropped a message stating that Captain Brooks was buried with full military honours and that Vautin was forced to land with his prop and controls shot away. One of them went out and picked him up and gave him a stunt over Jerusalem. There was a note also from Vautin asking for his kit to be dropped. So this evening Captain Jones and Lieutenant Paget took the kit over along with various notes and planed down to 50ft over the Ramleh aerodrome and dropped the lot. They waved to the HQ staff and recognised some of the German pilots who waved back to them. No 'Archies' were fired at them and only an odd rifle bullet." "Our B.F. No.A7194 went out on recco this morning at 8.20 and knocked a Hun over Nablus. They met eight Huns, five above and three below them and they turned sharply and dived on a scout which fell to earth out of control. The pilot was Lieutenant L.M. Potts who says he is evens with them now, meaning that he has made them pay for the loss of his brother, Lieutenant J. Potts. The observer, Lieutenant Hancock, also got a few rounds in with his back gun but he gives credit to Potts' gun for knocking the Hun." A couple of months later Leonard travelled to Port Said to front a medical board and on 5/4/18 he was admitted to 14 AGH hospital with a "Debility" and was taken off the "effective strength of No.1 Squadron AFC". He was sent home on 29/4/18 on the ship "Tofua" effectively discharged. We're not giving up the search just yet, there's still a glimmer hope. We hope this article might reach someone who knows something about Our Jack. Maybe it's the person who placed the flower at the base of his memorial recently, it wasn't there the first time we photographed it. It might be that we'll never find out who Our Jack is, in that case he will remain forever 'known only to those who knew and loved him'. Whoever commemorated Our Jack at St Mathews Church Cemetery created a fine memorial befitting one of our war dead. Lest we forget. Now, fast forward to 2013. Vera Bertola a journalist with the Macarthur Chronicle Newspaper had read Our Jack's story on Camden Remembers and saw our frustration in not being able to identify him. Vera decided to run the story on 30 April in conjuction with the Anzac Day coverage to create some community interest to solve the puzzle of 'Who is Our Jack?'. It wasn't long before we had a phone call from Vera with the great news the mystery of the identity of Our Jack had been solved after some 'dogged' investigation by researcher friends Colin Renshaw from Hill Top and Guy Oulden in Melbourne. CLARENCE STEVENS (19), charged with breaking and entering the dwelling-house of Lucretia Nanette Potts and stealing goods, the value 20 pounds, the property of Bertrand Gilders, has been arrested by Constables McCarthy and Hamilton, Detective-constable Geldart, Detective-Sergeant Sedgwick and Constable Skehan, Parramatta, The Oaks and Sydney Police. Committed for trial at Parramatta sessions. Lucretia Potts was Jack's mother and Bertrand Gilders was Lucretia's brother (Jack's uncle). We trust that this might assist in finally solving the question of the identity of "Our Jack". Pleased to be able to assist. The story also prompted an email from Jack Potts great nephew Oliver Sumner Potts from North Queensland after being told of the story by a Sydney friend. The family always knew the Memorial was Uncle Jack's, but we never knew the connection, he said. Our Jack is indeed Lieutenant Jack Diamond Sumner Potts who was killed in action while flying over enemy lines on 4 January 1918.......Lest we forget. If anyone else would like to contribute more information about Jack Diamond Sumner Potts and his family would you please contact us.